On a recent trip to England, my husband and I visited a coastal resort town in the Somerset area. Dining outdoors at one of the many seaside restaurants, I ventured to try a regional dish: Somerset Pork. However, the kitchen was out of pork that night, so I opted for Somerset Chicken instead, which I quite liked. 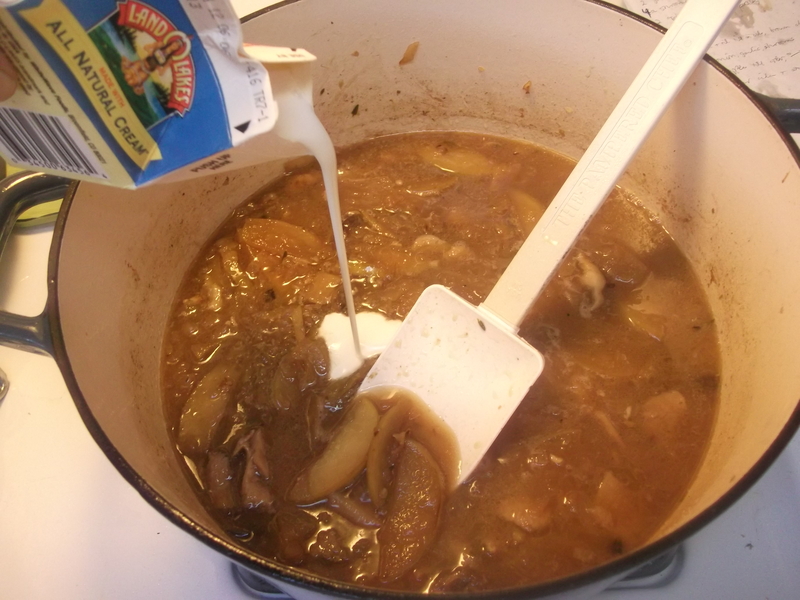 Somerset sauce is a creamy sauce made with apples and hard cider, both a specialty of the Somerset region, and is served with pork or chicken. As soon as I returned home, I wanted to recreate the meal using pork chops, and what follows is my take on this regional favorite. It’s prime apple picking season now, so go pick some fresh local apples and give this dish a try! 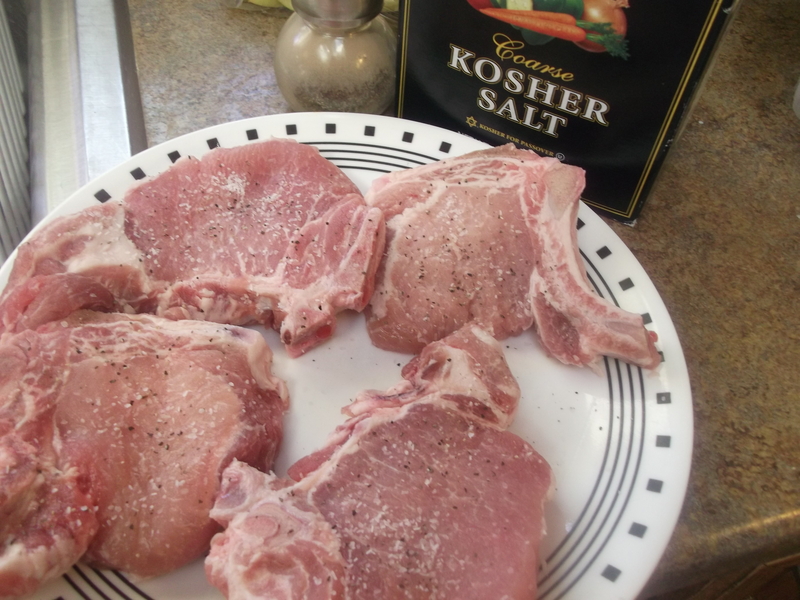 Season the pork chops on both sides with Kosher salt and pepper. Heat the oil and/or bacon fat and butter over medium high heat in a large Dutch oven, or other covered pot, until sizzling. 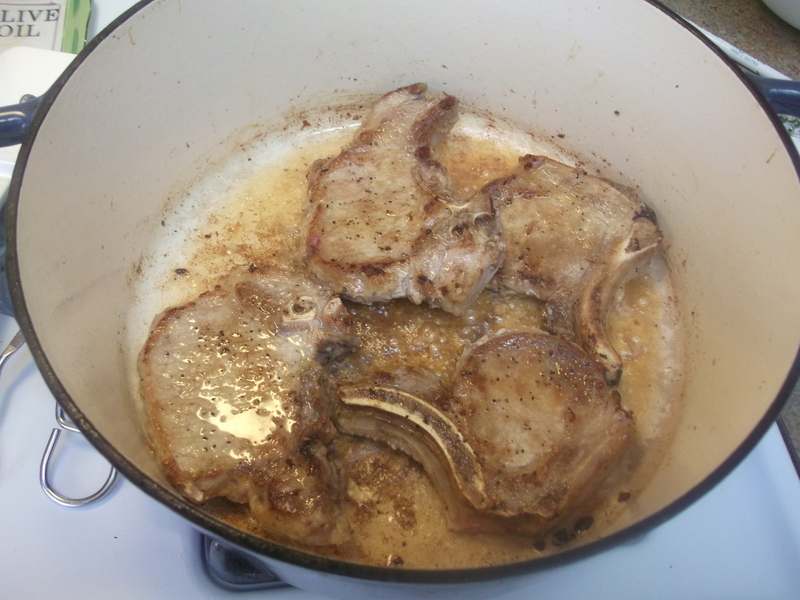 Add the pork chops and brown them for a couple of minutes on each side until they achieve a nice golden color. If the pot is too small to fit all of them at once, work in batches. 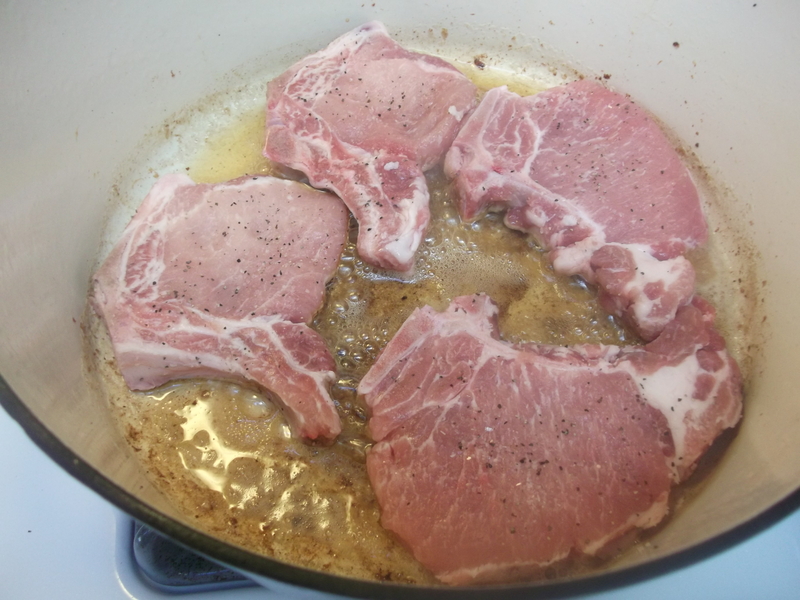 Transfer the browned pork chops to a bowl. 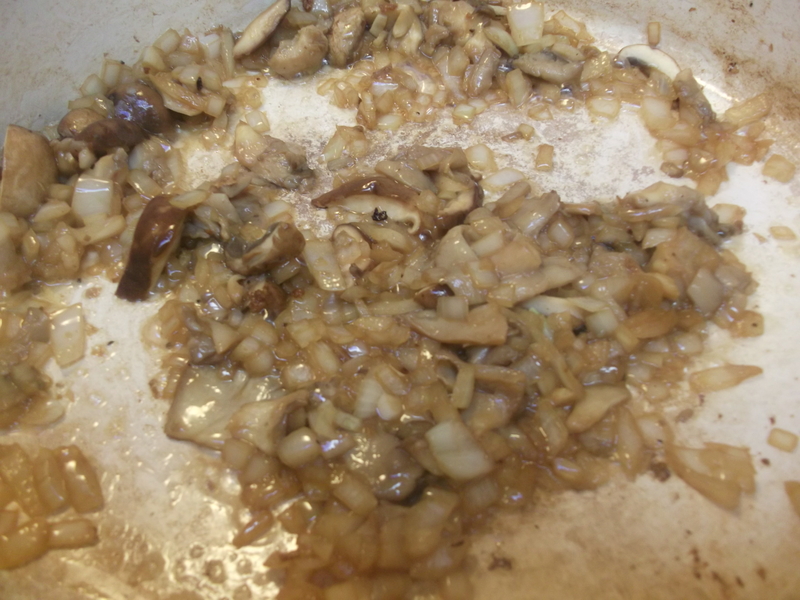 Add the onions, garlic and mushrooms to the pot and cook, stirring frequently, for about 5 minutes or until the onions are softened and the mushrooms are browned. Transfer this mixture to the pork chop bowl. Transfer the pork chops and largest pieces of apples, mushrooms and onions to a serving dish and tent with foil to keep warm. Heat the remaining liquid and boil 2-3 minutes to reduce the sauce a little. Lower the heat, stir in the cream, and allow it to bubble to thicken the sauce slightly. Add salt and pepper to taste, spoon the sauce over the pork, and garnish with chopped parsley. 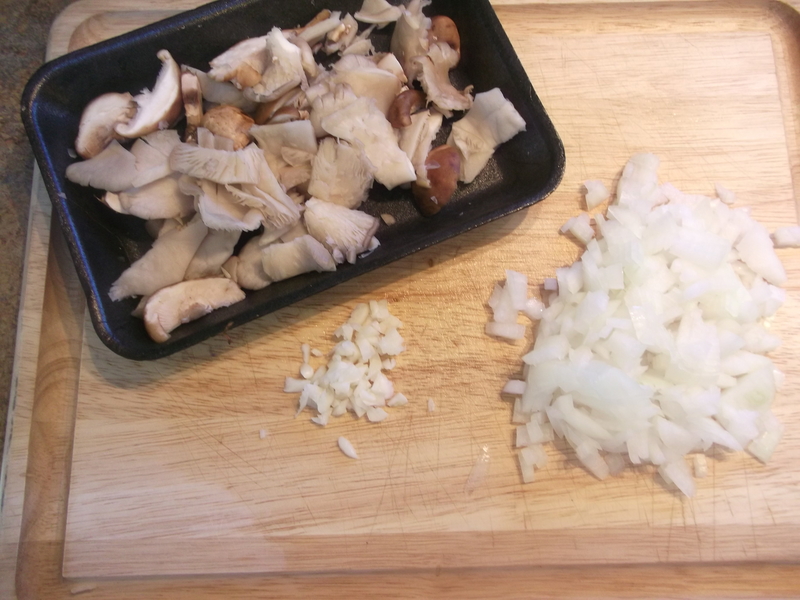 Start by mincing the garlic, dicing the onions, and coarsely chopping/slicing any variety of mushrooms you like. I used a combination of oyster, shiitake, and button mushrooms. 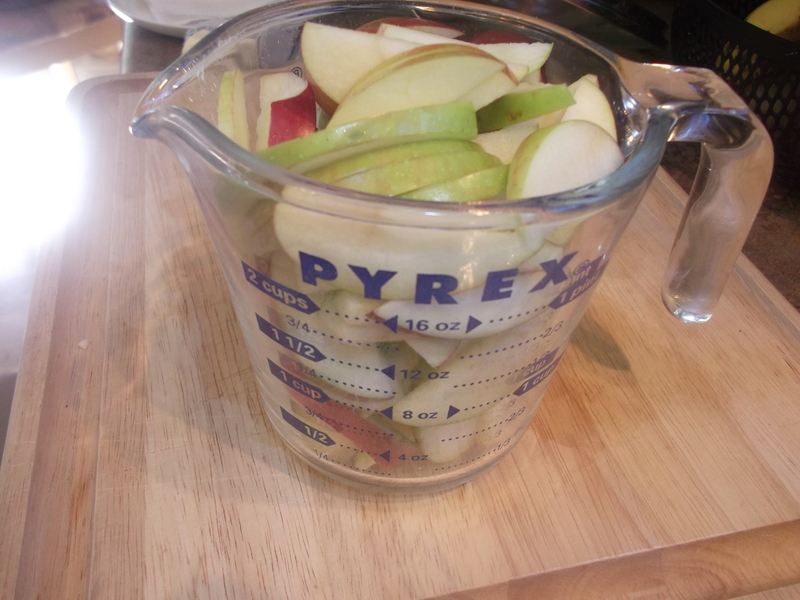 Next, slice the apples (no need to peel them first), and keep them covered in plastic so they don’t turn brown. 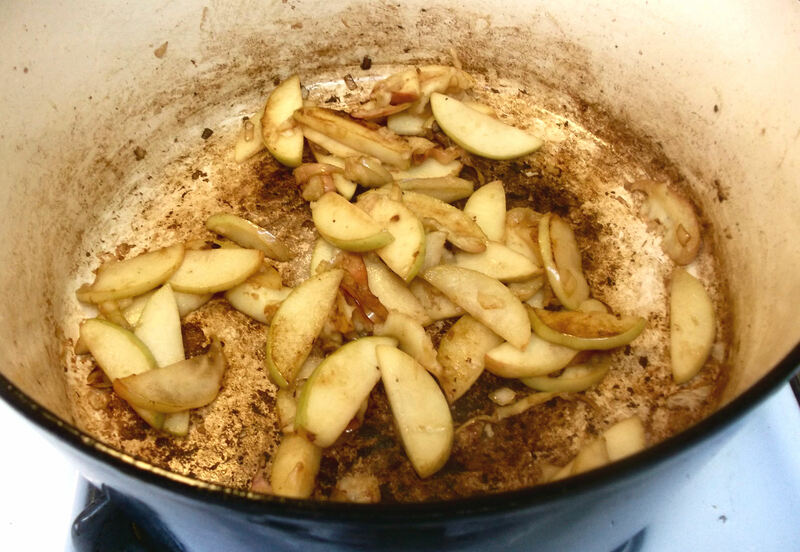 Usually, you can place sliced apples in water to prevent them from browning, but they should be as dry as possible when you add them to the pot, or they will not brown nicely. Feel free to use a couple different varieties of apples, but keep in mind that crisper ones will hold up better while cooking. Trim off the most visible fat from the edges of the pork chops and season on both sides with Kosher salt and pepper (Kosher salt works better than regular table salt for browning meat: it produces a much nicer color). Heat the oil and/or bacon fat and butter over medium high heat in a large Dutch oven, or other covered pot, until sizzling. I love using a little bacon fat in this step for extra porky flavor. Plus, to create it, you have to fry up a couple slices of bacon, so you get a tasty snack! Add the pork chops to the pot. If the pot is too small to fit all of them at once, work in batches so you don’t overcrowd the pan. I used my 7-quart Dutch oven and all four fit just perfectly. Brown them for a couple of minutes on each side until they achieve a nice golden color. 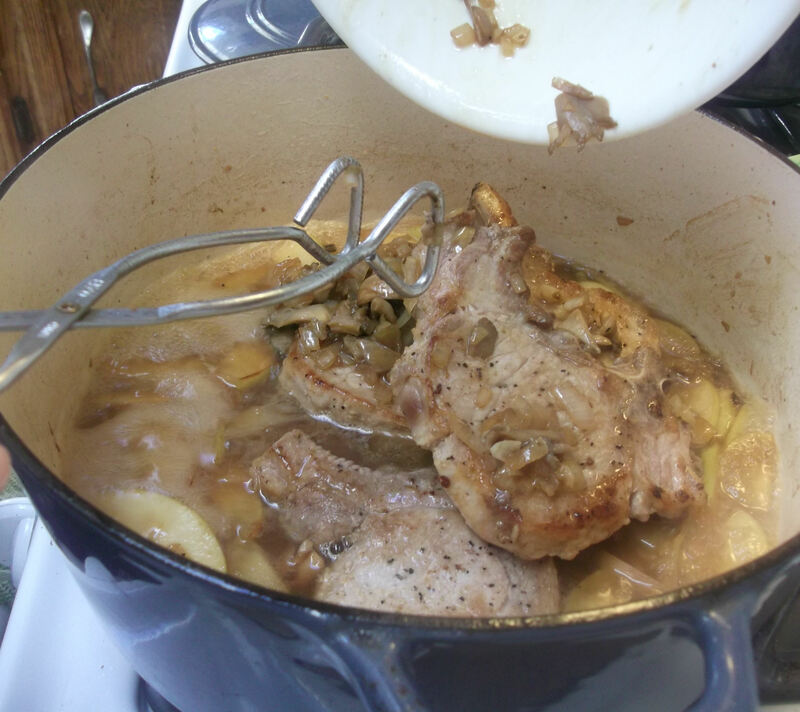 Using tongs, transfer the browned pork chops to a bowl. Add the onions, garlic and mushrooms to the pot. 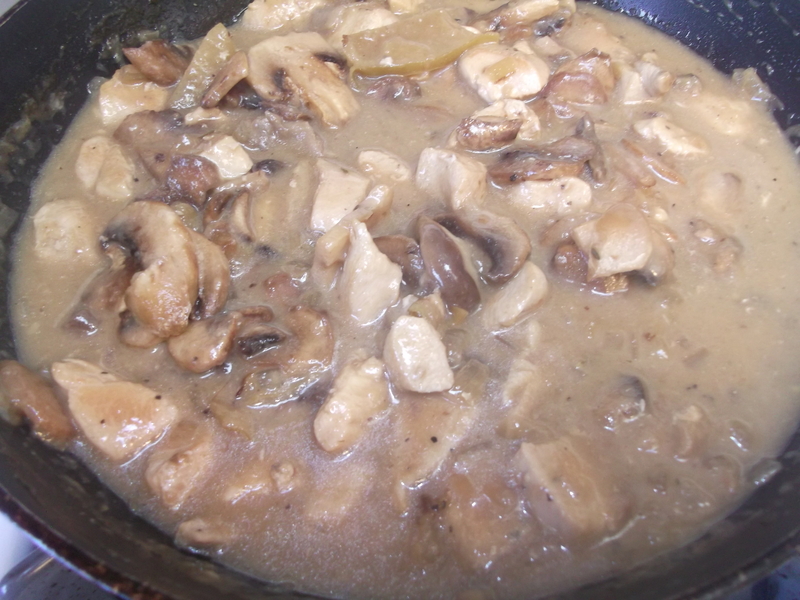 Cook, stirring frequently, for about 5 minutes or until the onions are softened and the mushrooms are browned. Transfer this mixture to the pork chop bowl. Hope you chose a large enough bowl. I did, but just barely. Add the apples to the pot and cook them for 4-5 minutes until they start to develop some color. Helpful hint: the less you stir them around, and the longer you allow them to just sit, in contact with the heat, the faster they will brown. 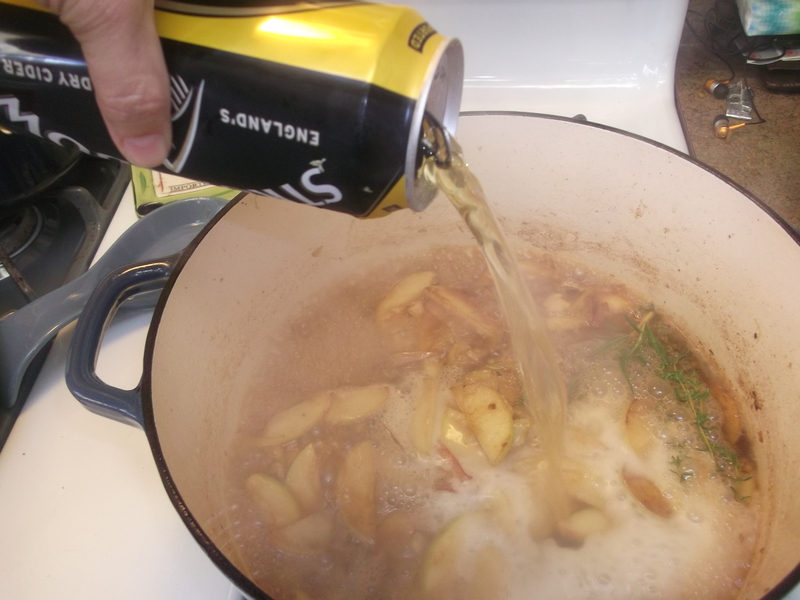 Stir in the lemon rind, stock, and cider and boil for about 3 minutes. Optional: add a few sprigs of fresh herbs. I used a small sprig of rosemary and two sprigs of thyme. 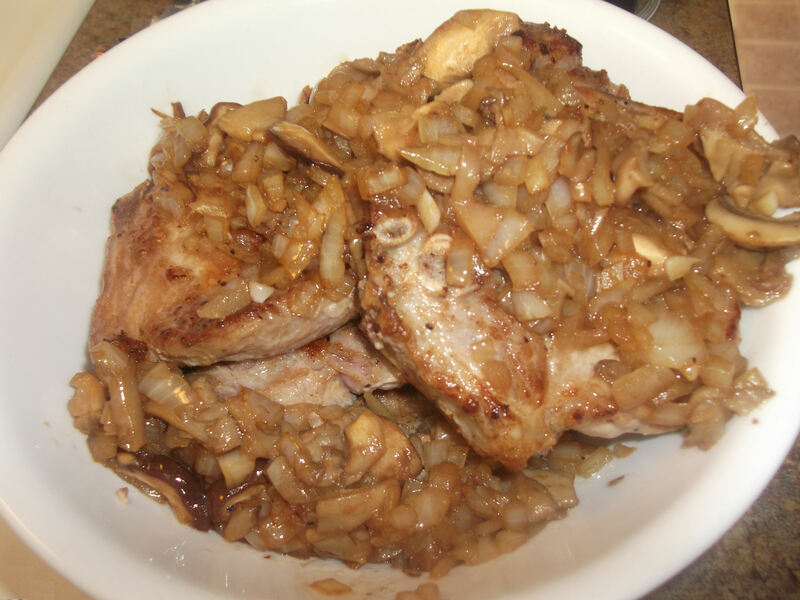 Return the pork chops and onion mixture to the pot, adding any accumulated juices. Heat the remaining liquid and boil 2-3 minutes to reduce the sauce a little. Lower the heat, stir in the cream, and allow it to bubble to thicken the sauce slightly. Add salt and pepper to the sauce to taste. To serve, place each pork chop on a serving plate, ladle some of the sauce over it, and garnish with chopped parsley. Pass remaining sauce at the table. 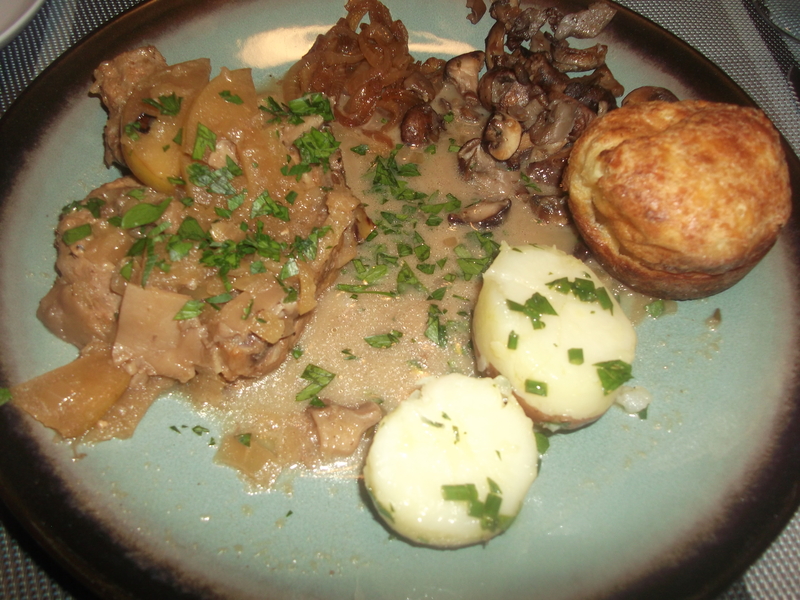 This meal is great with popovers (known as Yorkshire pudding, if you’re British) and boiled baby red potatoes (which look like hard-boiled eggs if you peel them and have a really bright camera flash like I did). Enjoy! Note: any remaining sauce makes for great leftovers! For example, lightly brown some chicken and simmer it in the sauce 15-20 minutes, and now you’ve got Somerset Chicken. Alternatively, this meal could be prepared with chicken breasts (whole), chicken breasts (cubed), pork loin (sliced or cubed) or pork tenderloin (sliced or cubed). Yum! Love that cider too! Impressive Yorkshire Pud too Diane…..recipe?